Bulls center Joakim Noah has been selected by NBA coaches to represent the Eastern Conference in the 63rd NBA All-Star Game. The announcement was made on TNT during its pregame show Thursday night. For Noah, averaging 11.7 points, 11.4 rebounds (second in the East and seventh in the NBA), 4.2 assists, 1.37 blocks and 1.14 steals in 33.8 minutes per game, it will be his second All-Star appearance in as many seasons. It also marks the fifth straight season that the Bulls will have a player in the annual game (Derrick Rose 2010, 2011, 2012; Luol Deng 2012, 2013; Noah 2013, 2014). Noah got off to a slow start in 2013-14, missing most of training camp and the preseason. But he’s turned it on since then, most notably in January as Chicago compiled an 11-4 record and moved into fifth place in the East. “It was a tough beginning to the year,” acknowledged Noah. “I trained really hard in the summer to be prepared for the year. I had an unfortunate little setback with my hamstring and it was disappointing. But we’ve gone through a lot of adversity throughout the year. Losing Derrick and then losing Lu was tough too. In his last 15 games, Noah has recorded 13.2 points, 14.3 rebounds, 5.8 assists, 1.87 blocks and 1.07 steals in 36.8 minutes per game. In addition, he has grabbed 10 or more rebounds in 17 straight games—the longest such streak of his career and the fifth-longest such streak in the NBA since 1977. 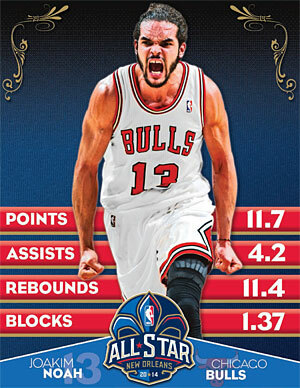 It’s that stretch that Bulls coach Tom Thibodeau recently called the best of Noah’s professional career. In light of the All-Star recognition, Thibodeau praised Noah’s all-around game and the affect he has on his team. In choosing the reserves, the 30 NBA head coaches voted for seven players within their conference, including two guards, three frontcourt players and two players regardless of position. Coaches were not permitted to vote for players on their own team. The 2014 NBA All-Star Game will be played in New Orleans on Sunday, Feb. 16, 2014 at 7 p.m. CT.